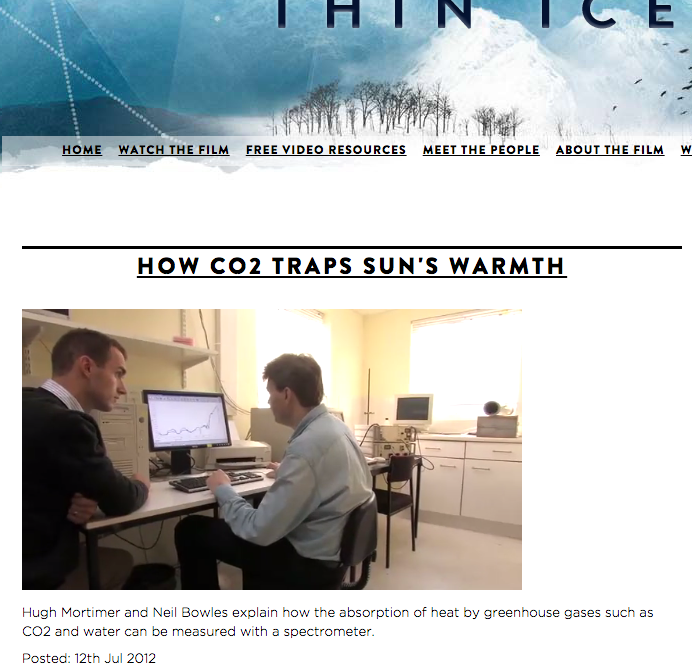 In the documentary Thin Ice I have identified a mistake that I would like to reveal to you. This mistake, if correct, is so large as to discredit not only the documentary but also the science. In the clip ‘How CO2 Traps Sun’s Warmth’ Dr’s Mortimer and Bowles use a spectrometer to demonstrate how CO2 traps heat. The two doctors present a spectrograph of the atmosphere - but there is - from the very first time we see the spectrograph - something wrong. The data is reversed. If we look at a typical atmospheric spectra as shown below Fig 2, we see the wave numbers (cm-1) increasing out from the origin, and a positively right skewed intensity curve. 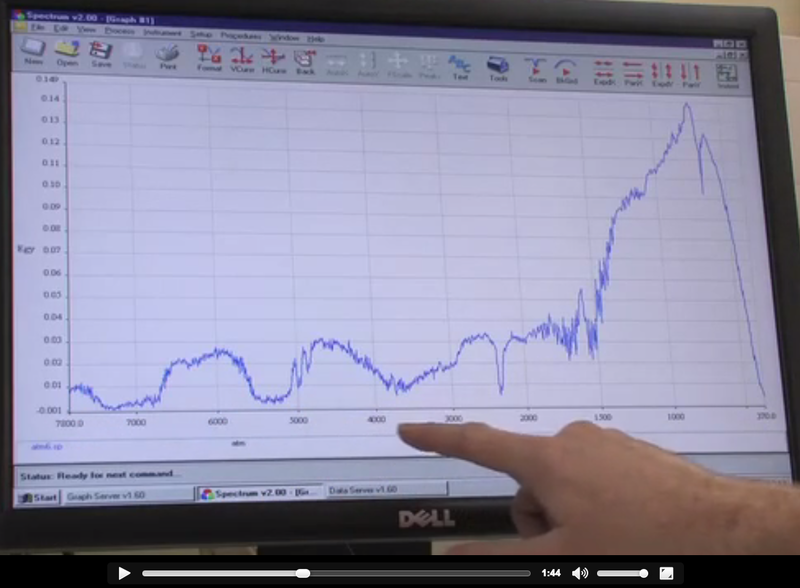 Notice the dip at and around 600 to 700 cm-1. 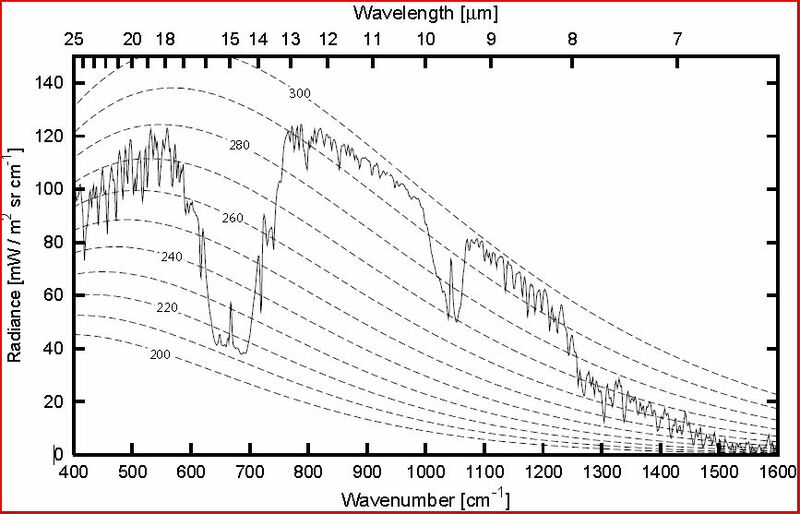 Below Fig 3 is their spectrograph. Here we can see the wave numbers reversed and the curve left skewing negatively. The range is larger than in Fig 2, but the dip identified can be seen at 600 or 700 cm-1 as above. This reversal would be no problem if it were acknowledged by the doctor, but it is not. The doctor goes on to explain how this is not how it should be: that is, it should be descending, and that there should not be a bulge on the right. He is claiming this 'bulge' is where the heat is trapped in the atmosphere. This is, on the grounds of the reversal, wrong, and is misleading. His interpretation is wrong, and he should, as a doctor of chemistry, know better - so I call this fraud. A manipulation of data. 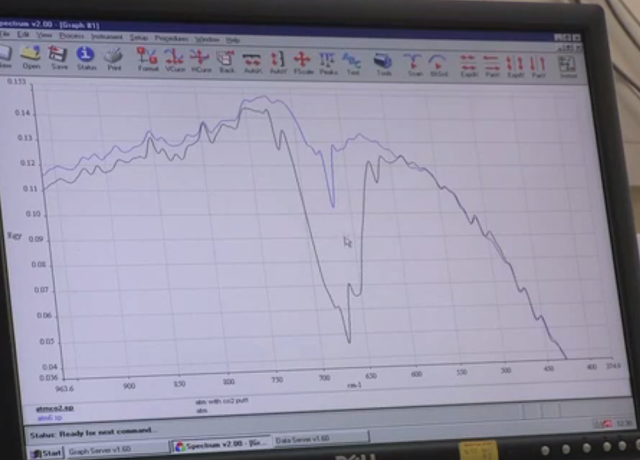 To finish with, we can see when he focuses in to demonstrate the affect of CO2 the 'dip' as identified earlier at 600-700 cm-1 clearly. This confirms we are looking at a typical (but reversed) atmospheric spectra. Fig. 4 Dip focused in. They are claiming heat to be trapped where it is not. Where they are claiming heat to be trapped, there is little to no energy to trap heat ( I think).